Nick Foles chose between the Eagles and Buccaneers in March 2017. His daughter helped bring him to Philly. Nick Foles will start for the Eagles at quarterback Sunday with a Super Bowl MVP trophy back home, but he could have been wearing a Buccaneers jersey playing against the Eagles this weekend. Before signing with the Eagles in March 2017, Foles narrowed his options to Philadelphia and Tampa Bay. His decision was not easy. "It was close," Foles said. "We were in discussions. My wife, Tori, and I were weighing all options. She was pregnant at the time, so we were really thinking long and hard. You talk about the business side of it. You talk about the family side of it." Family considerations led him to sign with the Eagles. 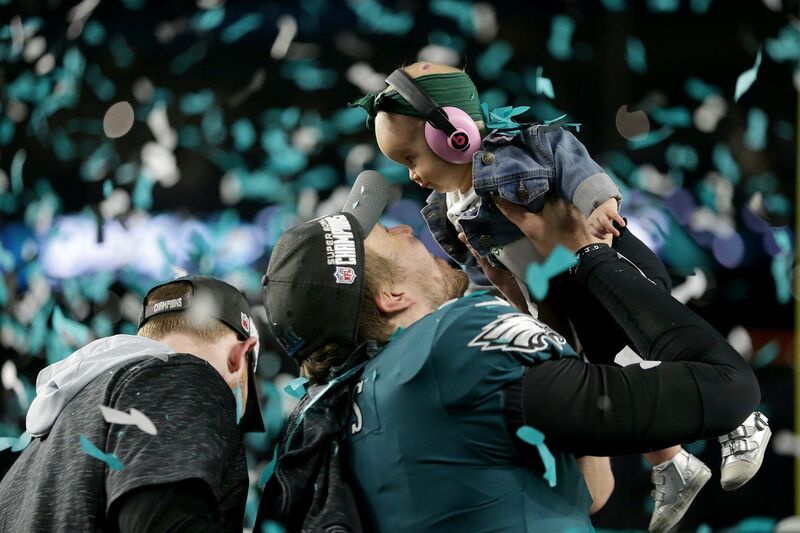 It's not a stretch to say that Foles' daughter helped bring the Super Bowl to Philadelphia. Tori Foles was six months' pregnant, and Nick Foles thought the off-the-field familiarity from his first three NFL seasons would help the growing family. The Philly Special might never have happened if not for Lily Foles. "Ultimately, we decided that Philly was our home once before, and we loved it. We loved the people here, we loved the city," Foles said. "What better place to be when we bring our daughter into the world? That was the big decision." After Foles chose Philadelphia, the Buccaneers signed Ryan Fitzpatrick as their backup quarterback. Both Foles and Fitzpatrick returned to their teams this season. And with Carson Wentz injured for the Eagles and Jameis Winston suspended for the Buccaneers, the two backups will start against each other Sunday. Nick Foles warming up for the Chiefs during a January 2017 game. Foles' first option was remaining in Kansas City after the 2016 season. The Chiefs declined his option, making him a free agent. Foles offered to take a hometown discount to stay, but the sides couldn't find a middle ground, Foles wrote in his book, Believe It. The Eagles and Bucs made the strongest offers in free agency. Foles was familiar with both coaches. Eagles coach Doug Pederson scouted Foles in 2012, putting Foles through a private predraft workout and serving as position coach during Foles' rookie season. Buccaneers coach Dirk Koetter recruited Foles out of high school when Koetter coached Arizona State. Foles committed to play for Koetter and reopened his recruitment after Koetter was fired, ultimately choosing Michigan State before transferring to Arizona. He remained interested in playing for Koetter in the NFL. "That seems like a lifetime ago," Koetter said. "We were excited about bringing Nick to ASU. Unfortunately, it didn't work out. I guess it's turned out OK on both ends. But, shoot, I loved Nick as a high school player, and his athleticism not only as a football player, but as a basketball player. I've followed his career closely ever since." Neither team offered a direct path to the starting job. The Eagles' franchise player was Wentz, whom they drafted after a blockbuster deal for the No. 2 pick one year earlier. Winston was the No. 1 overall pick in 2015 for the Buccaneers, and though his past year was not exemplary, he eclipsed 4,000 passing yards in each of his first two years and was coming off a 28-touchdown season in 2016. Foles needed to move past any bitterness that resulted from the Eagles' trading him in 2015. Chip Kelly was no longer coaching in Philadelphia, and owner Jeffrey Lurie and top executive Howie Roseman remained fond of Foles. They wanted him badly enough that they were willing to absorb the $7 million salary cap hit incurred by releasing Chase Daniel in addition to the $7 million they were guaranteeing Foles. "We made such a concerted effort to make sure we could get Nick back on the team," Lurie said in January. "We prioritized more money for the second quarterback position than most any other team in football. We even were willing to eat a lot of the contract we had, so we could go out and get Nick. We've always had so much confidence in Nick." Even though Koetter was in Tampa, Foles didn't know many others on the roster or in the organization. So there was more comfort in Philadelphia from a football perspective, too. But Koetter made sure it was not an easy decision. "The ball was in his court," Koetter said. "I respect the heck out of Nick. He made his decision for his reason, and I've seen what his reason is, I certainly respect it. That's fine. I get it. That's how this league works." Foles committed to play for two years in Philadelphia, where he had a foundation and a support system that would help him as a first-time father. The decision worked – both from a family and football perspective. But even before Wentz suffered a knee injury in December and Foles led the Eagles to the Super Bowl, Foles did not think about what would have happened had he gone to Tampa. "You're obviously grateful for the teams you talk with and [discuss] the business part with," Foles said, "but I was grateful to be here and just focused on being in Philly and being a daddy and all that comes with it." Nick Foles with Lily and his wife, Tori, at Disney World’s Magic Kingdom a day after winning the Super Bowl. Both the Eagles and Buccaneers pursued Foles because of his value as an experienced veteran backup, even though both had entrenched starting quarterbacks at the time. Since Foles returned to the Eagles, he has won six of the seven games he started, including the postseason. Eagles fans will never forget what Foles did on Feb. 4. Since Fitzpatrick signed with the Buccaneers, he has won three of the four games he has started. He was named NFC offensive player of the week in Week 1 after passing for 417 yards, four touchdowns, and no interceptions, with a 156.2 passer rating. "There's guys that are career backups, but there's also guys that have started a lot of games and been successful," Koetter said. "I look at those guys as starting-level quarterbacks. They've just got to be on the right team. I'd say Nick and Fitz are both guys that fit into that category." Koetter was bullish about the development of Ryan Griffin, an undrafted rookie in 2013 who had been with the Bucs since 2015, but had not played in games. The Eagles could have gone with Nate Sudfeld this season as the No. 2 quarterback and traded Foles, but they committed even more money to Foles knowing they might need both to play. Some teams choose to have an up-and-coming player as the backup – the Eagles might do it in 2019 with Sudfeld – but there's a sense of security that comes with having a player such as Foles or Fitzpatrick. "I think you're a little more cautious probably with a younger player a little bit," Pederson said. "These two veteran players have played a ton of football, obviously. They're playing well. They both have played well throughout their careers. I think you can open up more of your playbook and expose them both to more of what you're doing offensively." That will be apparent Sunday in a matchup of starting-caliber backup quarterbacks. Foles was close to playing for Tampa Bay – and if that had happened, the past year in Philadelphia might have been entirely different. "That worked out well for him, and we did great by getting Fitz," Koetter said. "It worked out well for both sides."